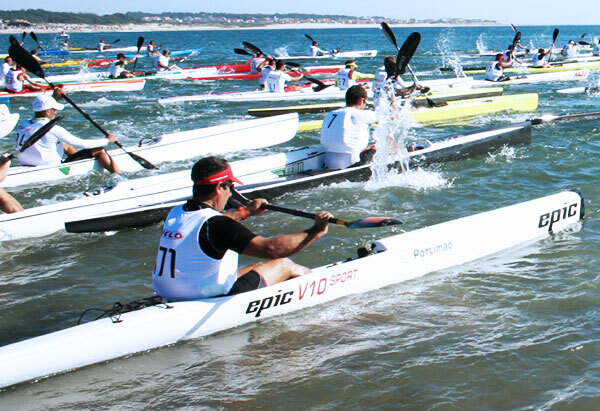 EPIC KAYAKS and PADDLES have always promoted the surfski sport. Our products are designed by World Champions using innovative solutions, engineering excellence, integrity, original thought and real paddling experience in every ocean in world. Members of the EPIC team have been developing the surfski education curriculum and building world class international events since the beginning of the sport. In the last few years EPIC has seen the surfski community grow and gain popularity and as a result the manufacturer list has expanded dramatically. After running the Molokai World Championships event in Hawaii for many years, we have learnt how much work goes into making an event like this happen. It is very important for the manufacturers to come together to make it a success. We are thrilled to confirm our support to the ICF Open Water World Championships in Portugal in 2013 and are happy to be associated with NELO, who are the main organizer of the event. It took few weeks to sort out all the details and EPIC is now officially on board and we will be providing rental surfskis, surfski clinics and technical support in Portugal this summer. We look forward to seeing you in Villa Do Conde this July! Greg Barton, Oscar Chalupsky and EPIC KAYAKS EUROPE Team.